That time of year is quickly approaching: The season of the ant. Each year, beginning in April and lasting through June, sometimes September for some species, you can find these little annoyances starting their annual swarm in search of food. They tunnel their way through the ground, the wood in your walls, and into your home. Once present, they can be difficult to get rid of, unless you know a few things about them. This blog is meant to educate you in identifying each type, and what to do to get rid of them, especially the Carpenter Ant. Cornfield Ants: Their swarms mate July through September. Found mainly outdoors, they are light to dark brown. Carpenter Ants: Mating swarms can be seen on warm sunny days anywhere in April through June. They are large in size and black or red and black. Yellow Ants: These swarms are common indoors in winter, but primarily mate April through September. They can be yellowish to reddish brown. Thief Ants: Swarms can be found July through September. They are yellow to light brown. Pharaoh Ants: These ants do not have mating swarms, they form new nests through a process called “budding” where workers will take pupae to a new location if the nest is compromised. They are light yellow to red. 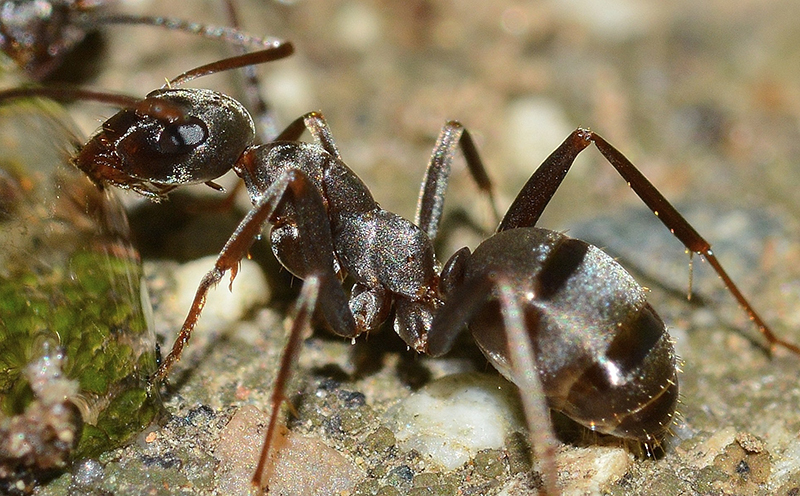 Pavement Ants: These ants are found May through July or under a heated slab foundation in winter. They are reddish-brown to black. Other ants that are less common are Field, False Honey, Odorous, and Acrobat. The swarm that occurs is a mating process where new queens with wings are reproducing with the males. They will then lose their wings and establish a colony as a queen. When an “interior swarm” is happening with winged ants inside of buildings, it is an indication of an ant nest that has made its way indoors. By far, the most common and the largest of these is the Carpenter Ant. These ants do not eat wood, as their name would suggest. They tunnel through damaged and decaying wood to make their way in and out of your home. They can be located behind bathroom tiles, tubs, sinks, anywhere where wood decay has occurred through exposure to water leaks, condensation, and poor air circulation. Their main colony, called a parent, is found outdoors. They can create one, or many, satellite nests indoors by transporting pupae and larvae into the new nest. Workers search for food and water to be taken back to the parent colony. Carpenter Ants feed on meats and sweets indoors. Outdoors, they feed on other insects, dead or alive. They also feed on honeydew, the secretion made by aphids as they feed on plant life. In fact, carpenter ants are known to defend a colony of aphids to help preserve their use of honeydew. Once you have identified the ant species, and that a nest is possible, you need to determine what to do to get rid of them. Spraying foraging ants with an over the counter insecticide is only a temporary fix. Until the entire colony is taken out via eliminating the queen, the ant issue will continue. As they continue their trek into your home bring in whatever they walk through. Ants have been known to transmit diseases such as the staph infection. Of course, the best solutions it to never have to encounter having an ant problem. You can begin with keeping your home clean. Dust and vacuum daily, always clean countertops of spills, and don’t forget about the trash can and recyclable containers. Even the bottles you dispose of need a good rinsing to help avoid providing sources of food for ant workers to find. Sealing up exterior cracks and crevices is an excellent preventative means of deterring ants from getting into your home. If you begin to see ant trails, one trick to disrupt them is to spray a mild solution of vinegar and water. This will throw off the pheromones they use to navigate. Eliminate high moisture conditions that attract them. Make sure gutters are draining away from home. Elevate wood when possible to create air movement. Trim branches that overhang the home, so these branches don’t contact the house. Look for small piles of coarse sawdust or wood shavings “frass” around wood furniture and support beams. Carpenter Ants damage wood by excavating and creating their nest. The tunnels don’t contain sawdust or debris; they are extremely neat pests. Look for areas of constant moisture, such as leaky plumbing or a leaky roof. These conditions promote the rotting of wood which is highly attractive to Carpenter Ants. Follow a worker ant back to the nest. It may not be readily visible, but where they travel will give you an idea where their source is. After their detection, the process ensues of elimination and control of the situation. The following are steps to adhere to when you find carpenter ants in and around your home. Eliminate and destroy the nest. This can be done through insecticides. The type you use will depend on varying factors such as outdoor or indoor treatment, allergies to products, pets, and small children in the home. The main thing to remember is to read the label and use a product as it is intended. Eliminate moisture problems. React to leaks and standing water around the woodwork of your home. If you take away the variables that attract carpenter ants, then they will search for a place that is more favorable to their living conditions. Maintain housekeeping in and around your home. Cleaning just once is the beginning. Schedule a routine around keeping trash, damp firewood, and dirty trash containers maintained. Contact a professional service when the ants persist or get worse. Using water to drown outdoor nests does not work. The use of any flammable liquid is dangerous and can cause an environmental issue. Home remedies such as red pepper and orange peels have no scientific backing. To have the most significant effect on Carpenter ants, as well as other pests, it is good to involve a reliable pest control company. An expert can identify the type of ant posing your problem, discover where they are coming from, and devise a solution that will rid your home of these nuisances. Abra Kadabra Environmental Services can provide a single treatment or design a prevention program for year-round confidence. We take our business seriously. Always striving to improve the lives of our clients with efficient, environmentally mindful pest treatments. Give us a call at (763) 537-0330 for more information and to discuss the issue you are facing.